Well, this is definitely the coolest news you’ll read all day! Researchers at Oxford University reportedly have made an exciting discovery about one of the most beloved painters of all time: The world’s foremost expert on whether Vincent van Gogh had tusks has determined that van Gogh did not have tusks. 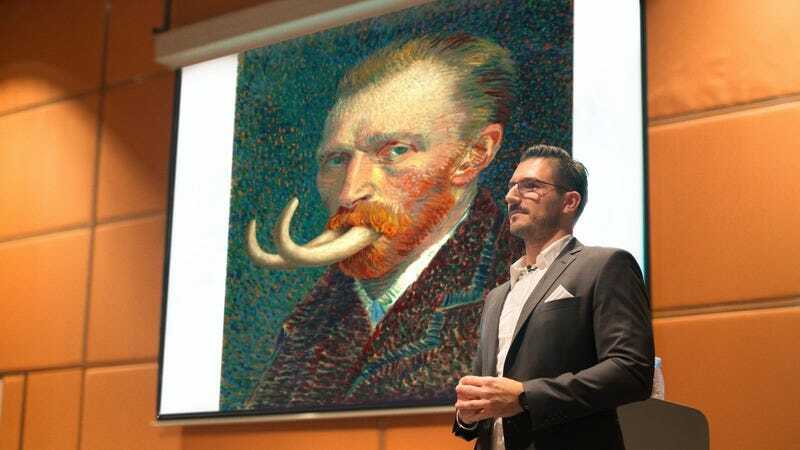 At a press conference this morning, Professor Evan McQuillen, who is widely regarded to be the top researcher in the field of whether Vincent van Gogh had tusks, announced that the Starry Night painter never had long ivory tusks jutting out of his mouth at any point in his life. While McQuillen and his graduate students had previously posited that van Gogh had two long, elongated incisors that were each over 1 foot in length, new research, he said, had disproven that theory. Wow. It’s not every day we learn something new about such a well-loved artistic figure, so this is pretty exciting for art fans and scholars alike. It sounds like we have the final word on the subject of whether van Gogh had tusks, and we can’t wait to see what kinds of new discoveries McQuillen makes next!